The objective of this study is to understand the dairy farmers' perception and preparedness for flood disaster, perceived losses due to disaster and their adaptation measures. 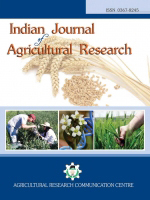 This study is based on both secondary and primary data collected through a survey of 400 dairy farming households from the Chamoli and Rudraprayag district of Himalayan region of Uttarakhand. The results of the study revealed that majority (61.50%) respondents were 36-50 years of age and among them 59 percent were female. The workforce mainly engaged in crop cultivation and animal husbandry, average land holding and livestock per house hold was just 0.46 acres and 5 animals respectively. About 78.6% farmers' perceived flood as a natural phenomenon, while 21.4% perceived it an unnatural and man-made tragedy. Around (59%) respondents reported that they participated in the village disaster management planning process and 87 percent perceived that state government is prepared for disaster management any time. Very few (15%) respondents received literature about disaster preparedness from developmental agencies. About hundred percent of respondents agreed that flood caused unemployment (50.8%SA&49.2 %A) in study area whereas, 55 per cent of respondents strongly believed that flood reduced the household income. About 91% of farmers preferred to stored crop residual and forage from forest area to fulfill the fodder demand during the anticipated flood. Majority (89%) of the respondents watching television, listing radio and reading newspaper for flood management practices. Also to mitigate disaster, the government provided various mitigation measures, but the level of satisfaction amongst farmers is low.